The image is integral to articulating understandings gleaned from observation and analysis. The pteropod, commonly known as the sea butterfly, is a species indicative of the ecosystem health of the Southern Ocean. I first knew about sea butterflies from reading the paper, Krill looks and feelers: a dialogue on changing perceptions of climate change data (Roberts & Nicol, 2011). My current work contributes an empathic response to what are otherwise mostly scientific descriptions. An X-Ray microCT scan of a shelled pteropod - Limacina helicina antarctica (sea butterfly) - is animated by a scientist, inspires creative direction by a visual artist and a score by an emerging composer. Slowly the shell falls into view and rotates to reveal its beautiful, delicate form. Just as we feel we could touch its fragile surface, it cascades away, the illusion dispelled. I am currently working in two roles with Arts Tasmania, that of Roving Curator with Small Museums and Collections statewide and Program Officer for Public Art in the North/Northwest of Tasmania. Previous to these positions I was an Art educator in a senior role at Scotch Oakburn College in Launceston for 27 years. My artistic practice has run concurrently with these roles for the last seventeen years, in many cases one inspiring the other. I have participated in solo and numerous group exhibitions throughout Australia and overseas. In 2004 and 2006 I won the Tasmanian Art Award and have been a finalist in a number of major art prizes including the Fremantle Print Award and Silkcut Print Award in which both my work has been acquired. My work has also been represented in the Alice Prize, Hutchins Art Prize, Burnie Print Prize, Rena Ellen Jones Memorial Print Award, Sunshine Coast Art Prize, Banyule Works on Paper Art Award and the Outback Prize. 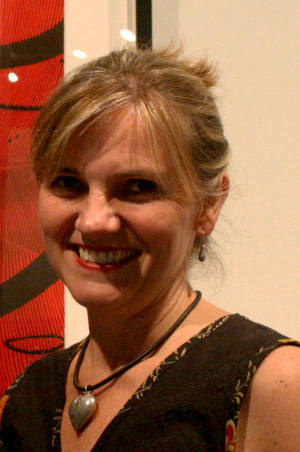 In 2005 and 2011 I was selected by the Print Council of Australia to produce a commissioned Member's print. My work is represented in Corporate, Tertiary, College and Private collections in Australia and overseas, and in the following Public galleries: National Gallery of Australia, ACT; Burnie Regional Gallery, Queen Victoria Museum and Art Gallery, TAS; Wagga Wagga Art Gallery, Grafton Regional Gallery, Tweed River Regional Art Gallery, NSW and the Warrnambool Art Gallery, VIC.